Dana and the girls (Madison & Taylor) were delayed in leaving Biston and didn't get into San Diego until well after midnight today. I woke up to the girls talking and laughing, so I got up and met them at 1:30 am then soon back to bed. They were real troopers and got up and respectively went to work and school. 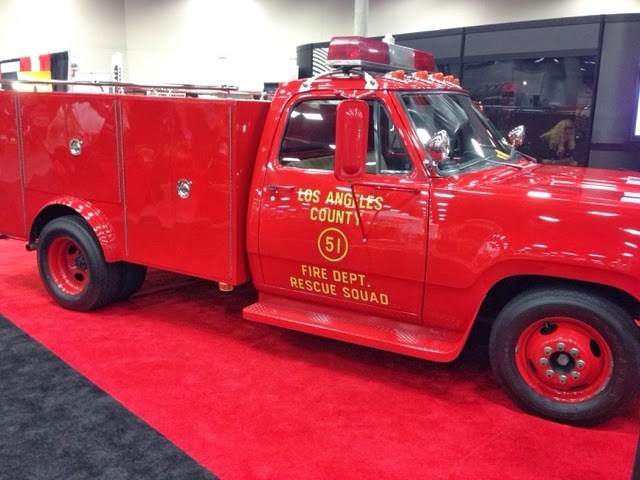 My day was planned out to go to Firehouse World that's in San Diego this week. 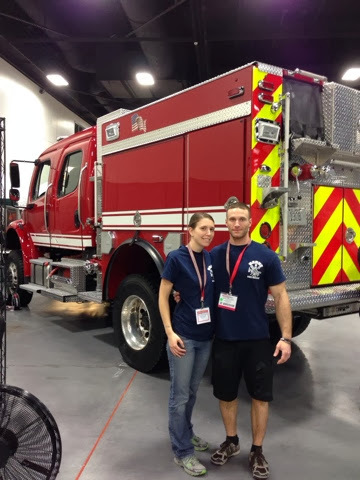 Specifically, I wanted to meet David Rogowski from Barre, MA Fire Department where he is a call firefighter, and at least his dad, uncle, and cousin are also on rhe department. 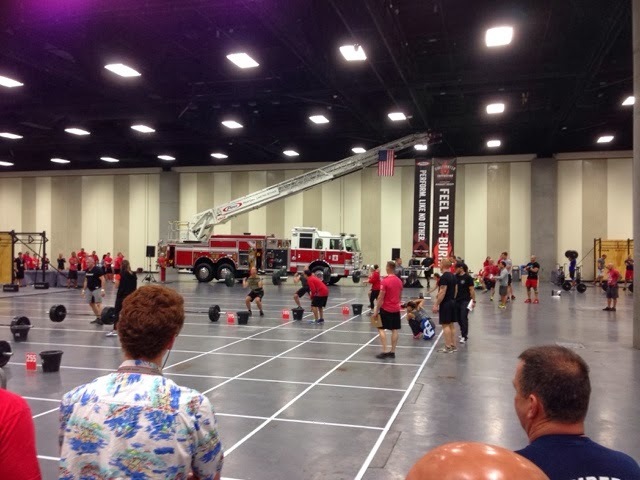 I was meeting David having found out before I left on this trip that he was chosen to be 1 out of 100 contestants that would compete in the Firefighter Throwdown, a competition of strength and agility. When I first found out about the competition I contacted David as my plans put me in San Diego at the same time of the show and I wanted to cheer him on. Here is the weight lifting competition from this am. This part of the competition was to fully press progressively heavier weights over their heads twice before moving to the next level. I had not met David before today. We exchanged texts and we met behind a short fire engine. Here is David and wife Lesley. David's full-time job is working at a body building site in MA, so this provided him with the musles that allows him to be a competitor. 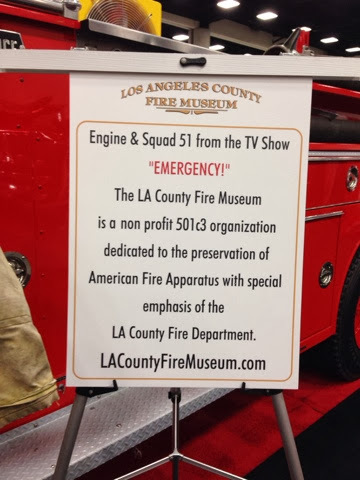 While waiting for David to compete in the next event I toured the Firehouse World Exibition Floor. 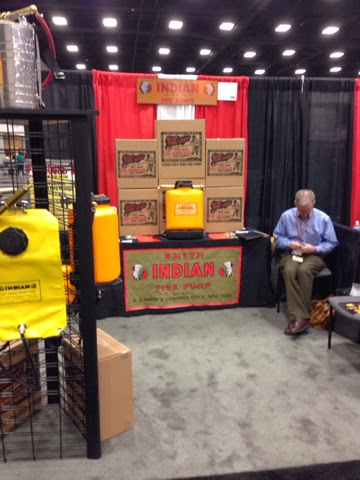 Here is the booth for Indian Pumpcans. You can buy them in the original metal or plastic. My first paid fire in 1967 was a brush fire and I wore one of these 5 gallon metal cans full of water to fight the fire. As much as things change, some things don't. 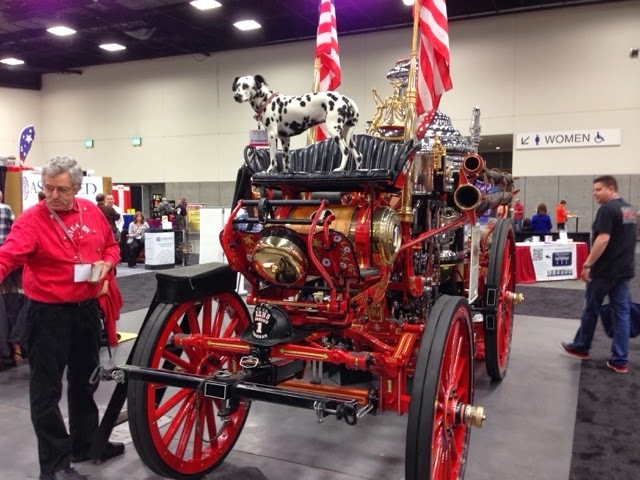 The CA Firefighters had this museum quality steam engine, complete with Dalmatian that turned his head to pose at me when I took the photo. 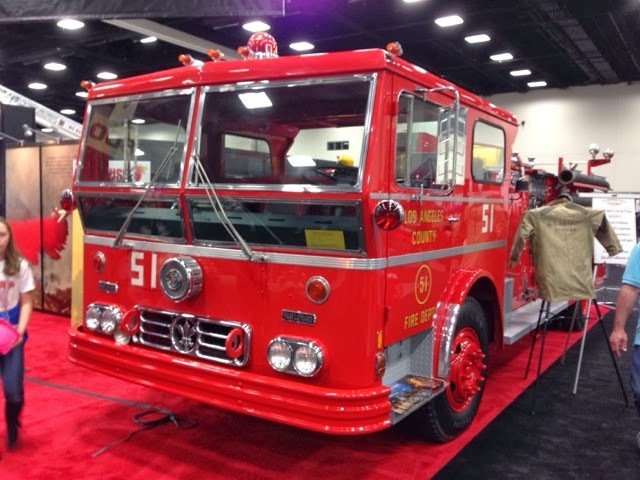 A number of years ago Engine 51 and Squad 51 toured the US and I didn't get to see them. Today here they were. What a piece of history. What young firefighter didn't love this show. I still find watching the show fun. I saw David again at the next competition where there is a part where you need to double skip ropes. (The rope needs to pass under your feet twice while they are in the air. I dont think I can skip once. Another part you have to carry a weight across the floor on your back walking in full squats. The top 10 out of 100 compete in the finals tomorrow. I told David that if he made it I would come back to watch him. 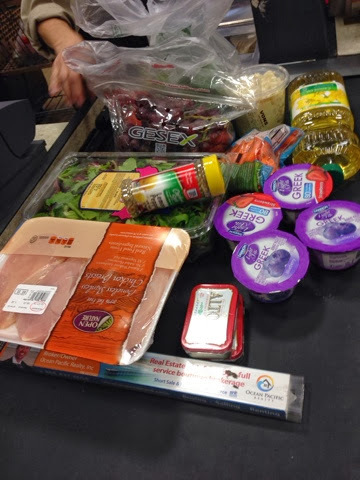 Then it was off to buy groceries for dinner as I decided to make dinner for the girls believing that the short night would not give us much opportunity to have a drawn out dinner and Dana didn't need this on top of her day either. A stop at Von's I picked up some chicken and vegetables to make for dinner. Also a few extra items for the fridge. 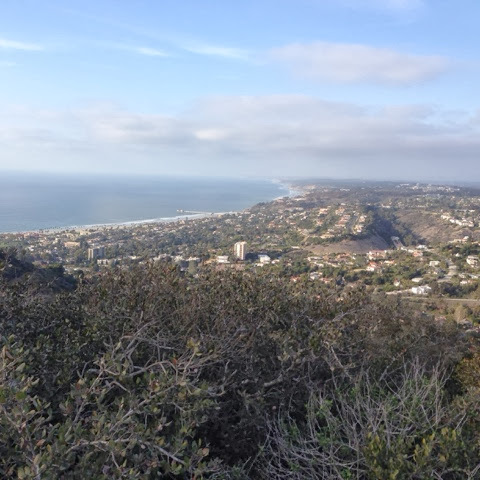 I had a short window to get a bike ride in to the top of Mt. Soledad. 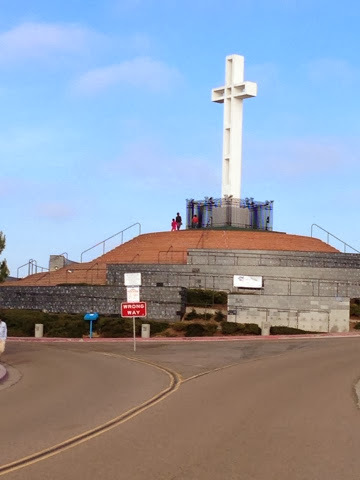 It isn't a distance trip at a mile from the house to the cross at the top. But it was about biking nearly all up hill to see how my legs are after yesterday's ride. My legs were tired and burning climbing the hill. 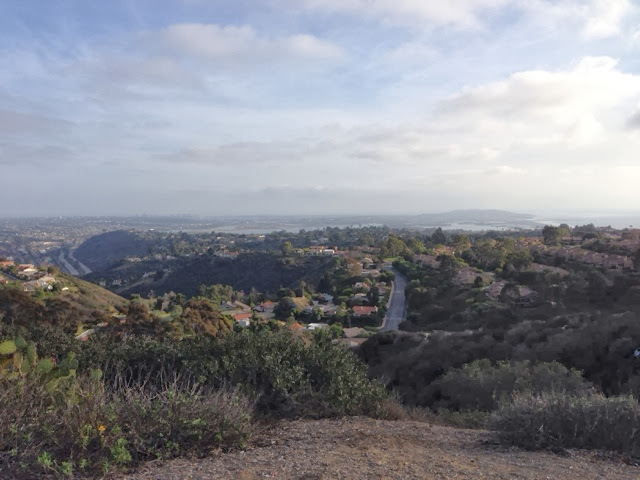 I will need to practice this each day to develop some stamina to be able to attempt going down to La Jolla and back up to the house. Here is a look south towards the city and Pont Loma. 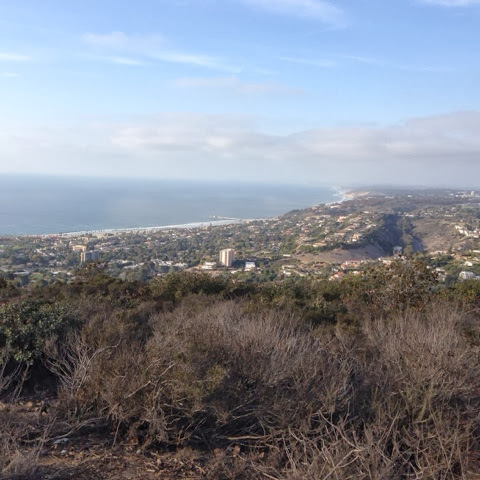 This is a picture looking north to La Jolla Shores, Scrips, and Torey Pines. 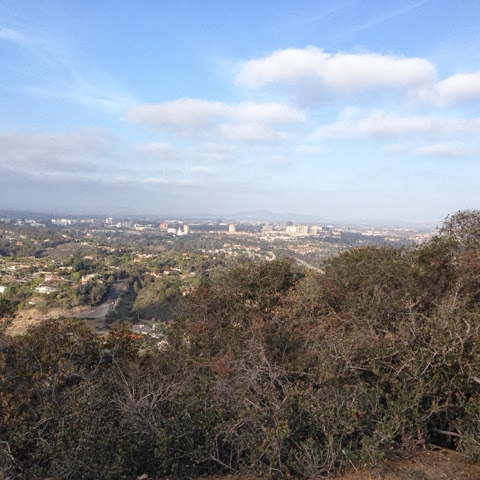 This picture is looking northeast to the University of California San Diego. I made it home to get dinner cooked and served when the girls came home. I won no awards from Madison & Taylor for my chicken & broccoli & store made macaroni salad, but I know that Dana appreciated my efforts.